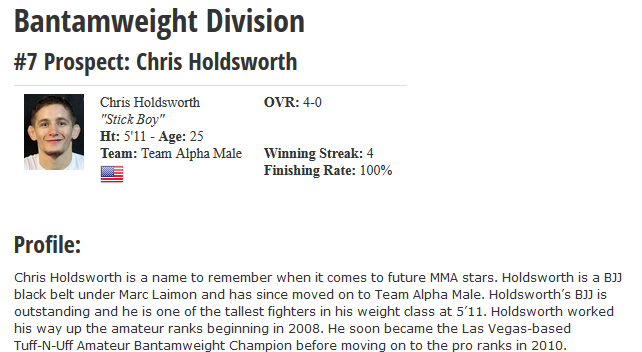 Chris Holdsworth is a name to remember when it comes to future MMA stars. Holdsworth is a BJJ black belt under Marc Laimon and has since moved on to Team Alpha Male. Holdsworth’s BJJ is outstanding and he is one of the tallest fighters in his weight class at 5’11. Holdsworth worked his way up the amateur ranks beginning in 2008. Within 2 years, he had built a 6-0 amateur record while also winning the Las Vegas based Tuff-N-Uff Amateur Bantamweight Championship. Holdsworth moved on to the pro ranks in 2010 and quickly resumed where he had left off, submitting his first 3 opponents in a combined 4 minutes and 19 seconds. In 2012, he signed with Resurrection Fighting Alliance (RFA), which is home to many of MMA’s top prospects. In his RFA debut, he submitted undefeated Tyler Shinn via triangle. He has yet to fight in 2013. Holdsworth has a wide net of connections in the BJJ and MMA world. He could not have a chosen a better place to go train than Team Alpha Male, which is home to many of the best lighter weight fighters in the world. Holdsworth’s striking is still a work in progress, but he more than makes up for it with his dangerous BJJ. 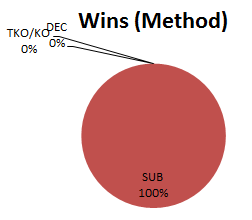 Holdsworth has yet to be tested in the MMA world. Holdsworth’s height is a huge asset, but it also puts some limitations on his ability to gain strength when competing against top-level wrestlers, i.e. Nate Diaz, Cole Miller, etc. As of now, Holdsworth is more than willing to go to the ground with his opponents, but he cannot simply rely on that strategy when facing the elite of his division.